How are wall boundary elements modeled? In this FAQ the user will learn how to correctly model the boundary elements in a wall structural system using Advance Design. Because the boundary elements are an integral part of the wall system, they have to be modeled in such way that the results take into account the system rigidity. To achieve that, all the elements will be modeled as planar elements. A simple wall with a thickness of 50 cm and 100 x 100 boundary elements will be modeled in this example. First, the outline of the future wall system has to be determined. In this example, the outline is imported from AutoCAD as a ".dxf" file. The wall with a thickness of 50 cm is drawn and boundary elements are modeled with planar elements with a thickness of 100 cm. In order for this structural system to work as a "whole", a wall group must be defined. This is done by grouping all the wall elements in a separate system. 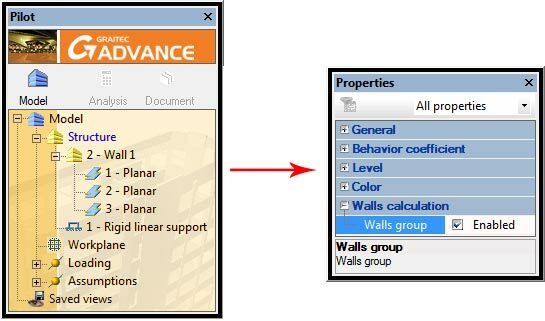 In the properties window, under "Walls calculation" activate the "Wall group" option. The wall is correctly modeled and can be analyzed. 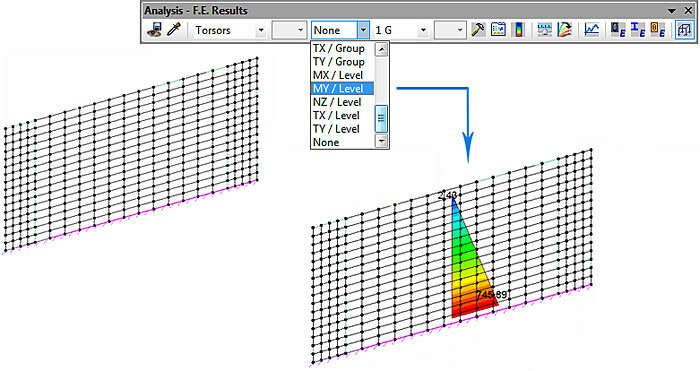 The results can be displayed using Group torsors in Finite Element Results. Note: Because the boundary elements are planar elements and have small "sectional dimensions", the mesh should be refined for a better stress integration.